If you like these cartoons, please help me make more by supporting my Patreon. A $1 pledge means a lot to me! The logic is poor. First of all, that the Democratic party had, and almost certainly still has, a racism problem doesn’t exonerate the GOP’s racism problem. There can be more than one racist institution in society at a time. But second of all – and this, obviously, is the cartoon’s focus – is that the Democrats of 1860 (who did defend slavery) simply aren’t the Democrats of today. So the question for a cartoon like this one is, will enough of my readers have encountered this ridiculous argument to enjoy a comic strip making fun of it? Also, admittedly the car in panel two is really only the front third of a car – but nonetheless, I drew a cartoon car and I’m happy with how it looks! That almost never happens. Now I have to do is learn to draw the back 2/3rds. The title is in large, cartoon-style lettering. At the bottom of the panel we see Walter, a man with black sideburns and a black top hat, wearing an 1860s style suit. Walter and a woman are on a sidewalk. The woman is walking towards a car that’s parked nearby. Walter is pointing at her and laughing as she looks back in annoyance. WALTER: How will you move this carriage without any horses? HA! Walter is walking down a grassy hillside, talking at two women who are walking away from him and trying to ignore him. One of the women is rolling her eyes. Both women are wearing pants. WALTER: A train that goes from coast to coast? HA! What a fairy tale! 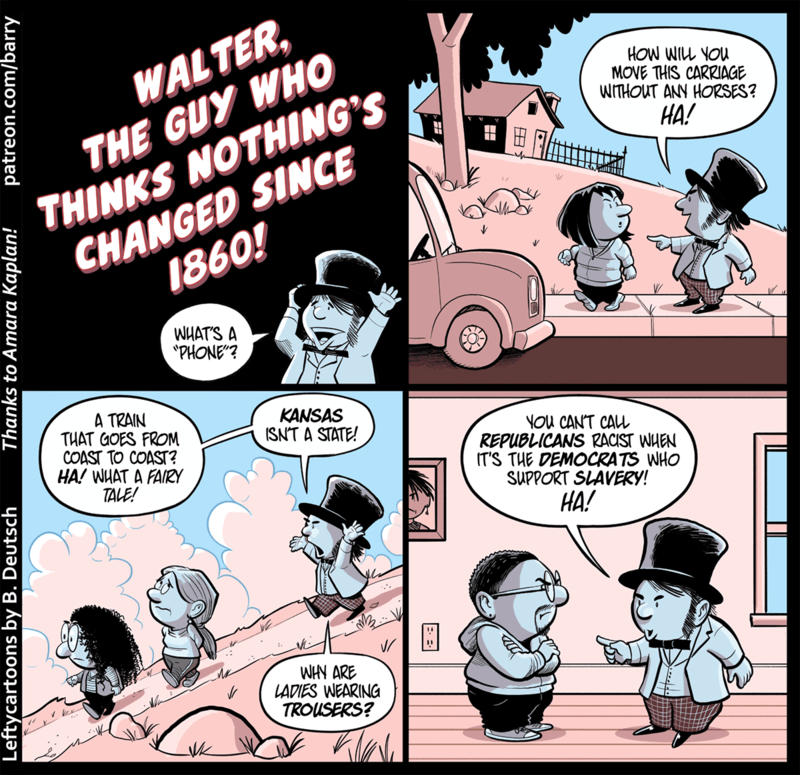 WALTER: Kansas isn’t a state! WALTER: Why are ladies wearing trousers? Walter, smiling, is inside a house (or some sort of building, anyway, talking to an annoyed-looking Black man with glasses and a goatee. WALTER: You can’t call Republicans racist when it’s the Democrats who support slavery! HA! By 1860, a transcontinental railroad would not have been considered a fairy tale by any means. The project had been in the public consciousness for a generation, federal surveys had been conducted for a decade, and bills for its final funding were discussed in the Senate, that very year. The point of contention was which regions would get to reap the benefits – there was absolutely no engineering hurdle. Steam driven horseless carriages have been around since at least the 1820s. London had steam buses in 1830. By the 1860s, private inventors in the US managed to get working horseless carriages on the road, and US newspapers were making fun of the British Turnpike acts seen as defending the horse drawn vehicle based on factually incorrect assumptions. Your character is not only stuck in the past. He is also ignorant. But yes, the argument in the last panel is still alive. If you try to keep up on the craziness from both sides of the political US divide, you’ll hear a lot of crap. There is an YouTube ad, narrated by a Black woman, no less, that seems to have been written by your character. I have encountered this particular argument many, many times. In fact, I usually now preempt it. In whatever comment I am making about Republican racists, I end with “and now you tell me that the Democrats started the KKK”. It’s been relatively effective. This comic would also work for people who call western counties “White Supremacist Patriarchies”. I think the basic point is fair, but I might quibble with 1860. I think he’s only about 60 or 70 years out of date; the political tradition that dates back to the Confederacy only really moved from the Democrats to the Republicans in the 60s. Slightly weirdly, my impression is that the Democratic party became the party of opposition to racism quite a lot earlier than that, because a two-party system makes for strange bedfellows, leading to some extremely contentious party conventions. He does have a fine hat, though. Speaking as a morris dancer, I covet that hat. 1. The character is correct for his time frame, and after – the Democrats DID support slavery back then. And prominent Dems opposed equal rights through the 1960s. 2. Did I say “through the 1960s”? The KKK endorsed Hillary Clinton in 2016, and she did not repudiate it. This was after Trump foiled a Dem-sponsored attempt to discredit him by having the KKK endorse him. One of Hilary’s closest mentors was Robert Byrd, who recruited for the Klan in his youth and participated in the Congressional filibuster to block the Civil Rights Act. None of the Lefties now conducting witch hunts of college professors, performers, and innocent bystanders ever repudiated him, or his generation of Dixiecrats. He served on major committees and was lionized as a Grand Old Man of the Senate. By the standards now used by Lefties to destroy peoples’ reputations, Byrd – and Lott, and Thurmond – should have been run out of politics. And Byrd repudiated the KKK many times. “I know now I was wrong. Intolerance had no place in America. I apologized a thousand times . . . and I don’t mind apologizing over and over again. I can’t erase what happened.” But yes, if he were starting his career over today, that probably would be an impossible barrier for him to overcome, and I’m okay with that. You mentioned Thurmond, presumably because when he first got into politics, in the 1940s, he was a Democrat? But of course, he switched to the GOP, as did many other Dixiecrat racists. Really, that just proves the point of my comic – things change. Trent Lott never ran as a Democrat, as far as I know, so I’m not sure why you brought him up. “Senator Byrd reflects the transformative power of this nation,” stated NAACP President and CEO Benjamin Todd Jealous. “Senator Byrd went from being an active member of the KKK to a being a stalwart supporter of the Civil Rights Act, the Voting Rights Act and many other pieces of seminal legislation that advanced the civil rights and liberties of our country. I can’t imagine a more clear reformation. Anyone who brings up Byrd’s racist history without also mentioning his reformation is, essentially, lying. Especially when their purpose is to smear someone by association with him when that association came long after his reformation. Ben David, you may as well be the guy in the cartoon; you, like him, are cherry-picking historical facts while ignoring everything that happened in history after those facts. The “Byrd was a Klan member” argument is literally no different from the “Dems were the party of slavery” argument in that regard. It is an appeal to historical ignorance masquerading as historical insight. It works on people who know only enough history to be fooled by it, and not a jot more. I don’t know why you’d expect it would fool anyone here. This was after Trump foiled a Dem-sponsored attempt to discredit him by having the KKK endorse him. I have no idea what this refers to. It sounds like conspiracy theorist nonsense. How exactly did the Democrats “have” the KKK endorse Donald Trump? Do we control the KKK now? Because if we do, I have a lot of ideas on how they could change things in their organization. Step 1 would be disbanding. Also, why on earth would Dems need to manipulate the KKK into endorsing the most anti-immigration president of the modern era? Wouldn’t they…already want to do that, since stopping non-white immigration is the KKK’s number one policy goal?